Turkey? Check. Mashed potatoes? Check. Gravy? Check. Green bean casserole? Check. Pumpkin pie? Not this year! 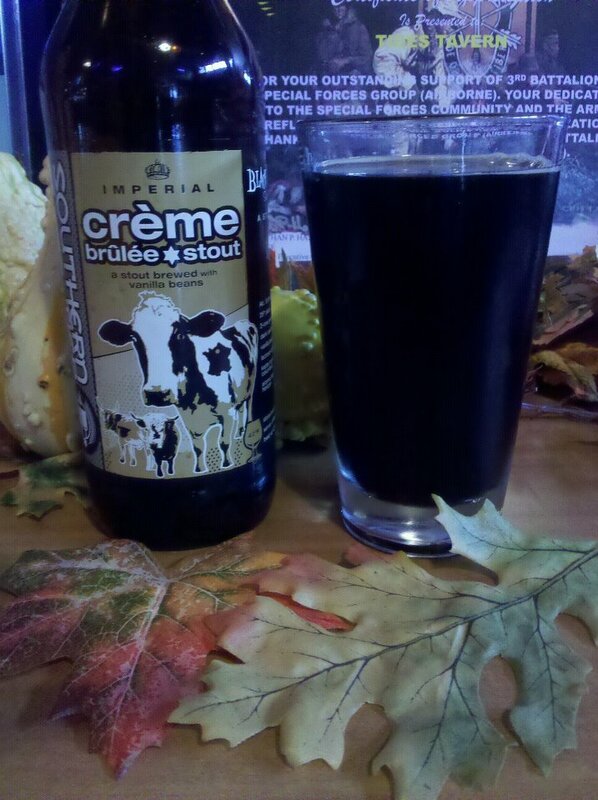 Thanksgiving dessert in my house is going to be Southern Tier Brewing Company’s crème brûlée Imperial Milk Stout. Never had dessert in a bottle before? Boy are you missing out. My bartender suggested this fantastically crazy beer to me, and I’m sure glad he did. Brewed with vanilla bean and dark caramel malts this stout engulfs your senses with a sweet, rich vanilla/caramel aroma. The first sip and you are hooked! Full bodied, malty, creamy and rich, crème brûlée Imperial Milk Stout really does taste like the wonderful dessert for which it is aptly named. Columbus hops and horizon hops mellows out the sweetness of the malts but trust me, this stout is very bold, rich and strong. The gentlemen I had the pleasure of enjoying this brew with (my husband and the guys at the pub) agree that this is no “chick beer.” And at 9.6% ABV you will definitely want to share with others…and designate a driver. Oh, a word of warning to my lactose intolerant readers; this is a milk stout and has lactose sugars added so drinker BEWARE! Although this is Southern Tier’s summer seasonal release it is still available in 22 oz bottles. And I think it will be a nice substitute for the traditional pumpkin or pecan pie (sorry Grandma).